Quanto è sicura la tua auto? When the car used for the frontal impact was inspected after the test, a cut was found in the driver's seatbelt, extending about a quarter of the way across the width. The partial cut, near the point where the belt attaches to the bottom of the B pillar, was thought by inspectors to have been caused by the belt being getting caught in the seat runner during test set up in the lab. 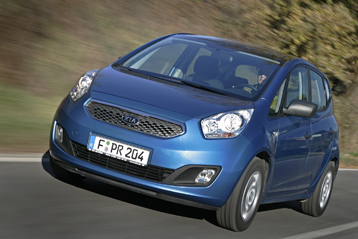 KIA have reacted to the inspectors’ finding by designing protective sleeves which fit over the lower part of the belt. This modification has been immediately instigated on production cars. Owners who have already taken delivery of their cars are being urged by Kia to return their vehicles to dealers to have the sleeves fitted. In the frontal test, dummy readings suggested that the driver's chest contacted the steering wheel. Structures in the dashboard represented a risk of injury to the knees and femurs of both the driver and passenger. The passenger dummy recorded a high differential movement between the upper and lower parts of the inboard leg, an indication of knee injury risk. The passenger compartment remained stable in the frontal test. In the side barrier impact, the Venga scored maximum points. In the more severe side pole test, dummy readings indicated marginal protection of the chest and good protection of other parts of the body. Protection of the neck against whiplash injuries in a rear-end impact was good. In the frontal impact, the head of the 3 year dummy, sat in a forward facing seat, did not move forward excessively. However, on rebound, the dummy's head struck the C-pillar trim. In the side barrier impact, both dummies were properly contained by their respective restraints. The passenger airbag may be disabled to allow a rearward facing child restraint to be used in that seating position. Clear information is provided to the driver regarding the status of the airbag and the system was rewarded by Euro NCAP. A permanent label warns clearly of the risks of using a rearward facing restraint in the front passenger seat without first disabling the airbag. The bumper scored maximum points for its protection of pedestrians' legs. The front edge of the bonnet provided marginal protection. In most areas likely to be struck by the head of a child, the bonnet offered good protection but was predominantly poor in the areas where an adult's head might strike. Electronic Stability Control (ESC) is an option on one variant of the Venga in four European countries; otherwise, it is standard equipment. As it is to be fitted as standard in the great majority of sales, it has been included in Euro NCAP's assessment of the car. A driver-set speed limitation device is available as an option but its did not qualify for assessment as it is not standard on any variant. A seatbelt reminder system is standard equipment for the driver and front passenger seats. Nota: altre dotazioni possono essere disponibili sul veicolo ma non sono state considerate nell'anno del test.